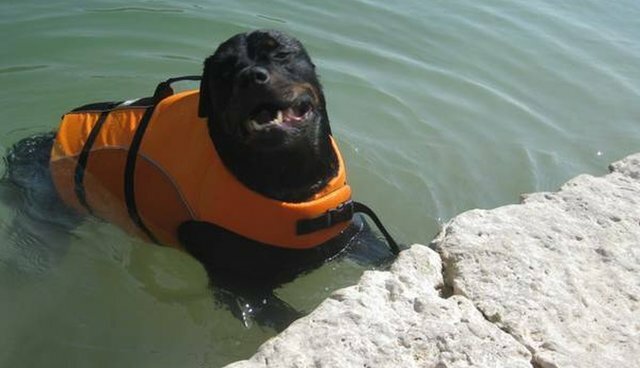 This might be one of the sweetest Craigslist posts ever - a California dog-mom is searching for someone with a pool who's willing to let her 10-year-old rescue dog Waylon swim in it occasionally. Jenny, Waylon's human, explains in the ad that he has arthritis, which makes it hard for him to do the things he loves. "He's happiest when he's swimming, pain-free and weightless," she wrote. "It's kind of the cutest thing ever." Jenny is looking for a kindhearted dog lover with a pool who will let Waylon come splash around every once in a while - and she's willing to pay in vegan cooking lessons, lawn mowing, whatever it takes to get Waylon the relief he needs. "Making Waylon's remaining time on the mortal coil as pain-free and fun as possible is most important to me, and if you have a pool you could let us use, I'd be so forever grateful." Know any animal lovers near Los Angeles with a pool? Send them Jenny and Waylon's way!